". . . marching proudly back to the future . . . "
You have nothing to fear if you have nothing to hide. You have nothing to hide if you have nothing to fear. So fear nothing and you need not hide. Hide nothing and you need not fear. The 10th anniversary of 9/11 has come and gone. And while The Department of Homeland Decency is pleased with how much more decent the Homeland became in the years following 9/11, much still has to be done. For instance, we have not yet claimed a complete victory in protecting traditional marriage from those who would make it indecent and perverse; there are still activist judges out there letting anyone marry anyone! Nor can we state that our schools are back to teaching just the facts; they still teach that we come from apes, they don't allow prayer, and some teachers actively recruit kids to gayness! So we still have much to do in our proud march backwards to our future. No doubt you want to know what you can do to help. There are many things, but here are a few to get you started. Feel free to contact us and let us know anything else you may be doing for the cause of Homeland decency. Make a 9/11 resolution. We do it on New Years. Why not for 9/11? Are the 10 Commandments in front of your State Capitol? If not, why haven't you done something to put them there? Are you represented in Congress by a liberal? Or by a woman? Or by a (children should read no further) homosexual? You must resolve to help correct these things; that's how we will find our way back to the future. Eat more meat. Most Homelanders take meat for granted, but it is an important part of our Homeland tradition. It's what the pioneers who tamed this great land ate, and we honor them by eating more meat in one sitting than they ever imagined possible. Meat gave them strength and character. So if you are trying to decide whether to have meat or vegetables for dinner tonight, think about this: If your life or the life or your children depended on a decent, god-fearing Homelander fighting an indecent terrorist to the death in an airplane spiraling out of control because the terrorists shot the pilot, who do you want in that fight? A meat-eating, SUV-driving, Fox News-watching Homelander? Or a vegan who drives a hybrid and quotes NPR? Eat more meat! It's what decent people do. Report a neighbor. We are always happy when a Homelander reports another Homelander; it tells us you are alert and aware of the dangers of indecency in the Homeland. Does a neighbor subscribe to Mother Jones or belong to Public Television? Do they argue late at night about civil liberties? What's in their recycling bins? We need to know. Report these or any other suspicious activities today and help us march proudly back to our future! Buy our “Condoms Can Explode” refrigerator magnet and put in on your refrigerator at work. The Department of Homeland Decency has a full line of refrigerator magnets that everyone should have on their refrigerator. Some of our favorites are: “Be wary of folks who visit France too often;” “Aggressive women who initiate 'it' make men nervous;” and “Poets who don't rhyme should go back to where they came from.” These magnets provide a daily reminder of what is important and decent and why so many have gone to war to protect our way of life. So put this magnet up at work and save a young woman from a life ruined by indecency. Someday she will thank you. Rent a big SUV and tailgate a hybrid. Remember how decent the Homeland was when everyone drove gas guzzlers? The bigger the engine, the better. Homelanders scoffed at electric cars. So tailgate that hybrid. Flash your lights. Rev your engine. Let that indecent hybrid owner know what the score is. And don't walk to the grocery store for that bottle of milk your forgot. Drive a big car there. And then leave it idling while you run into the store. Finally, write your Congressman and tell them to make the poor pay more in taxes. No one ever became decent by taking handouts. That just makes them want to stay home and watch TV which leads to hedonism, liberalism, atheism and anti-Americanism. On the other hand, if they pay more in taxes, they will have to get a second job (or maybe just a first!). That will keep them busy, too busy to be indecent. As always, it helps to buy The Department of Homeland Decency's Rules and Regulations Manual for you, your family and your friends. It's the only way you can be sure you truly understand 9/11 and remain a decent and pure Homelander. DOHD gives this newest entry in relig-lit a read-it-or-else recommendation. It is a very moving yet very terrifying story of a young boy who went to the dentist for a routine checkup. But, unfortunately, he got an infection, died and went to hell before doctors revived him and brought him back to life. Literally to Hell. That's why this story is so remarkable. Almost all the near-death stories you hear tell of someone who dies and then goes to heaven where they see God, Jesus, Gram and Gramps, some angels, and maybe even their pet dog that died years before. It's a warm and cuddly experience for everyone, and they always eagerly relate it because so many people find so much hope in these stories. But this is the opposite: a young, innocent child suffers a horrible accident, for some reason goes to Hell and comes back with horrifying stories of smells and fires and smoke and evil dope-smoking hippies and all kinds of indecencies that we hope to rid the Homeland of. And we know young Billy Anderson's story is true, because there is no way such an innocent child could know any of these things without actually experiencing them all firsthand. That's why there is so much we can learn from this book. What is remarkable is that here in this brief book, Billy answers so many questions that people have wondered about since time began. What is Hell? Who goes there? What do you have to do to go there? Is everyone there Christian? Where is it? Are there any nice cats and dogs in Hell? Or just mean pets? We at the Department of Homeland Decency have long supported decency initiatives because we know they will improve the quality of life for everyone in the Homeland and make our great land a beacon of hope for people in benighted lands — which is just about everywhere else. Those familiar with our goals are familiar with these initiatives: share a sandwich with an immigrant co-worker, because “Nothing says Homeland like a good sandwich.” Neighborhood Decency Patrols. Our studies that prove that medical marijuana weakens people and makes it easier for indecency to enter their lives, even if just for a week or two before they die..
Hell is a terrible place for a young boy. There are no cute animals or pets, only means ones. Same with old people: they are all old and cranky and overweight – none of the sweet old people with eccentric habits most of have learned to love. No one is having fun or a nice conversation or playing games, either. And Hell stinks, because everyone there has gas. That gas, in fact, fuels the fires of Hell. Only vegetables and bran are served, so there will always be gas in Hell and terrible smells. Never any good food. Never any good pancakes or donuts to bring joy to the morning. Billy's story has a happy ending, however. Doctors worked furiously on him and were able to revive him and now he is healthier than ever. His grades are better, too, and his whole neighborhood has responded to his story by doing everything it can to be the most decent neighborhood in the Homeland. To honor him, all his neighbors have sprayed for dandelions and crabgrass. No one on his block listens to NPR anymore. And you won't find any NY Times being delivered in the neighborhood anymore. Nope. Everyone just is happy to listen to Fox News all day, because that's one place where decency begins. Read Billy's book. Learn from it. And then be sure to buy “The Decency Rules and Regulations Manual.” Read it and make everyone in your home understands it. Discuss decency issues with your family and friends. Because won't you feel bad if, on the day of judgment, you end up in Hell? For keeps? Especially for something stupid like visiting France too often and thinking their indecencies are probably OK? Remember: we are marching proudly backwards to our future. It's never too late to choose decency. Q: I agree with the DOHD’s insistence that English should be the language of everyone that lives in this country. So I am uncomfortable with my children having to learn another language in school. If they are forced to take French, I worry they will start talking only in French and then start behaving like French people – like joining unions, demanding free health care, and taking naps during the afternoons. If there is no way I can stop my child from having to learn another language, is there one language that is better and safer to learn than another? A: DOHD is adamant that English be the first and preferred language of the Homeland. If you wish to speak another language, you are absolutely free to go live in the country where that language is spoken. That’s what makes our Homeland such a great place. DOHD intends to sponsor an “I Only Talk English” bill that will require all citizens of the Homeland to speak English at all times, even in their own homes. The bill will also relieve all those agencies/businesses – governmental and private – of the burden of having to cater to non-English-speaking residents. It will also put an end to multi-lingual instruction manuals. You are right to be concerned about your child being forced to learn a foreign language. The rest of the world must become accustomed to the idea that the Homeland is still the leader of all that is moral and decent. Until things change, schools can still require your children to take a second language. You may not have a choice in the language they study. If you are given a choice, try not to choose French – for obvious reasons that have been expressed many times in this handbook. Q: What should I do about a neighbor who never buys anything new? While I am not against recycling (even though it seems like a liberal idea), isn’t it possible that too much recycling is not a good thing for the Homeland? My neighbor – who, by the way, has a good job and makes quite a bit of money – always buys used cars, shops at second-hand clothing and furniture stores and even brings back her grocery bags to the grocery store so they can be used again. What, if anything, should I do about this? A: While recycling was probably started by liberals, we at DOHD have always been on board – until recently. Recycling cans, bottles and newspapers is fine. Buying used cars is dangerous. One reason our Homeland is strong is because we produce new things and people buy them. If people stop purchasing new things like SUVs, the backbone of our Homeland – large manufacturers – becomes brittle and weak. Without a strong backbone, the Homeland becomes prey to large foreign manufacturers with strange and unhealthy ideas about morality. You can see what a slippery slope this can be. If you buy a lot of used merchandise, people in other countries (like France where doing “it” is a normal part of the day, like drinking wine) start to look more stylish, drive better cars and sit on nicer couches than we do. A strong Homeland is a brand-spanking new and sparkly Homeland, not a rusty, threadbare Homeland. We suggest you continue to buy new things and make a point of showing off your new things to your neighbors. If you fail to impress them, we have ways of impressing them that, while maybe not legal, are relatively painless. Please contact DOHD at info at homelanddecency.com with your questions. Together we can all march proudly backwards to our future! The Winds of Change are blowing. First, Tea Partiers in the House of Representatives are going to do what they have never done: read something not written by Glenn Beck. In this case, the Constitution. They are going to do it to start this session of Congress. Of course, maybe they are hiring someone to read it, so they might not actually be reading it. But close enough. Second, someone in the Obama administration actually criticized Republicans. Really. Said it would be insane of them to let the U.S. Default. Of course, that's not the same as calling them insane, but it's not a bad start. Can Obama keep this up? The suspense will be intense. And the last thing we want to bring up: our favorite Supreme Court Justice Of All Time, A. Scalia, will be educating House members on the Constitution. He will be giving Michele Bachmann's colleagues in the Constitutional Tea Party Caucus To Save The Constitution And The American Way Of Life From Atheists, Scientists, EPA Bureaucrats, and Liberals, or whatever she's calling her group, important insights into the Constitution, ones that they might not have gotten just from reading it during the opening House session. And here's what's really exciting: We were lucky enough to find in the trash a copy of A. Scalia's draft notes for this important talk. Really!! That's another big change this New Year has brought: we actually got up, went outside, looked around and found something important to write about. Of course, some of Scalia's notes were torn and others were covered with food stains, so we can't reproduce these draft notes with complete accuracy. But we think we came close. We used the best methods known to reproduce these and believe in our heart of hearts that the following is what Scalia actually wrote in his draft. We are very proud to print them here. We all can learn from this learned judge. So read it, think about it, and act accordingly. SPEECH TO CONSTITUTIONAL CAUCUS SCHOLARS ON CONSTITUTIONALITY OF CONSTITUTION, ETC. What is constitutional? What makes something constitutional? Judges do. Judges get paid very well to do this. It makes us important. It's why we are called “judges.” Man judges, that is. Important to stress that. Constitution does not mention women. Screw Kagan. Why doesn't she have kids? And Sotomayor . . . I still can't pronounce her name. Why wasn't I appointed Chief Justice. Should I bring that up? I'm the man. Damn frat boy president. I should have laughed at his fart jokes way back in the 90s, when his dad was prez. That's why I'm not Chief Justice. How was I to know he'd get so far? Should've laughed at his fart jokes. Damn. I hated frat boys in college. Still hate em, even if they do get to be prez. HOW DO YOU WRITE A CONSTITUTIONAL LAW? Make it short. Short is good. Easier for judges to figure out and understand long things. Or remember what was on page 1084 or whatever. Roberts and Alito are always missing things on any page after 10. They can't keep up. Damn pretty boys, not an original thought in their heads. Their eyes glaze over as soon as lawyers start using those Latin terms. Or big words. They hate big words. In fact, most judges do and just use them because people expect it. But we hate them. So keep laws short and use small words. WHAT ABOUT THE INCOME TAX? Is income tax constitutional? Everyone wants to know this. Is the 16th amendment constitutional? The original constitution didn't let you tax income the way we do now. We should go back to that. Why should an amendment take precedence over the original Constitution? That doesn't seem right. The founders wrote the original, not the amendment. Shouldn't we honor that? Plus: tax discrimination comes into play. We don't give equal protection to different rates of pay. Do we want to live in a world where discrimination is OK, even discrimination against billionaires? I don't know if I do. Equal protection for high income tax payers -- I hope to make that happen. Damn. I'm the man. We have to man up and face this. Women aren't special, why treat them special? If you stop and think about it, there's one reason and one reason only: we're thinking with our Johnsons. Nothing says they get equal protection, not even the equal protection clause. It never says “Women” in it; it doesn't say “all women are created equal” in the Constitution, either, so why does everyone think they are special? It's onerous, that's what it is. A burden on good people everywhere to have to put up with women at work, play, school, even the bench here. Sotomayor never shuts up. Maybe some of you have noticed that. I can barely get a word in! Really important point here, one my whole career is building toward: is the constitution itself unconstitutional? I've been waiting for something like the Tea Party for help here. Bring me a case and let's call it unconstitutional and start over. I'm sick of doing it bit by bit. In case you haven't noticed, I'm not getting any younger. So let's go after it and really make liberals mad. There goes their free speech, their separation of church and state, their voters' rights, equal protection, clean air and water, everything. I can't wait! Bring me the case!! Hey, there aren't any reporters here, are there? I better make sure. Can't let this get out before I'm ready. The USA Decency Act (Deny Evolution, Combat Europe, and Never ever Concede that You might be wrong about anything anytime anywhere) created the Department of Homeland Decency to lead us all proudly backwards to our future. This is a future we are all familiar with. It's a future where men work all day without unions or overtime. There is no Social Security. Women also work all day, but at home rearing children and cooking large meals for their hungry men. And, or course, children get to pray in school. Then, one day, after a long rewarding life, the men fall over dead, exhausted. There is no Medicare or Medicaid so they don't linger and become a drain on a productive Homeland. Nor do they have pensions or Social Security, so the women have to become productive in their old age: they take in sewing or washing or they cook. With their children grown, they now become working women and enjoy a second phase of a productive life. And they continue along this career path until they, too, fall over dead, exhausted. It's a great future for our Homeland. But will you fit in? That is why you need this book. 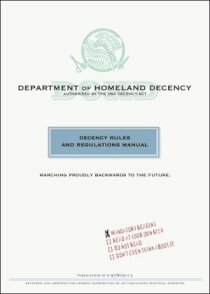 The Department of Homeland Decency's Decency Rules and Regulations Manual is required reading for the serious Homelander. What will you do if you find out that your children are being taught by a single woman who is wanton? What if the two single men living alone together walk down the street hand in hand? And should your children have to put condoms on a banana in school? To learn how to be a more decent Homelander, order your copy today of The Department of Homeland Decency's Decency Rules and Regulations Manual from Three Rivers Press. It is now available at bookstores everywhere, including Amazon.com. It's the only way you will know how to behave as we move proudly back to our future!